Join me in Chicago in October at P3 Conference hosted by the Legal Marketing Association. Regular readers know that a consistent theme in this space is the role of established business practices in a modern law firm. While it may have been possible in the past to operate a law firm as a hobby in between billing hours, and it may have been possible to generate handsome profits without regard to the client's perceived value, and it may have been possible to ignore standard business metrics because the phone always rang, the modern law firm leader and the modern law firm must adapt. 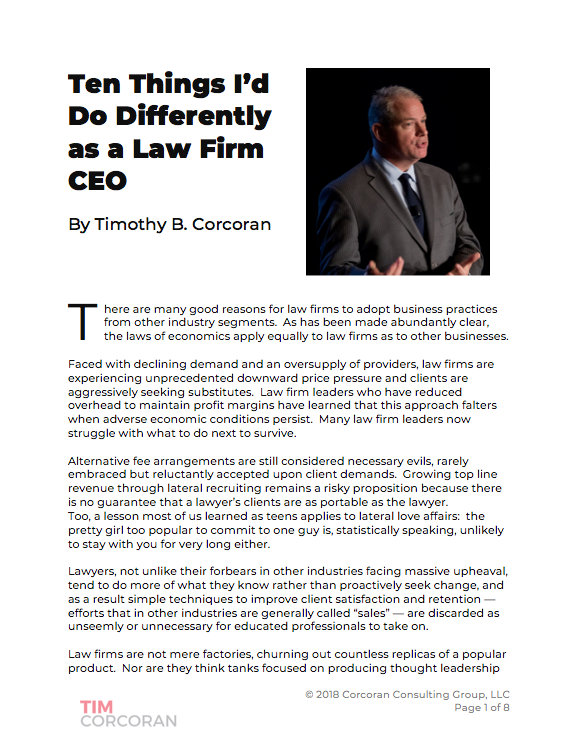 As clients increasingly look to extract cost savings from the legal function and improve the predictability of outside counsel expenses, it's critical for law firms to change with the times: strategic pricing, alternative fee arrangements, project management, leadership training, cost accounting, return on investment and other micro-economic lessons are necessary components in the modern leader's toolkit. The Legal Marketing Association has combined these topics into a multi-day conference designed to provide comprehensive education and to provide networking opportunities for those whose daily duties involve these topics. The P3 Conference will commence on 30 September 2013 and concludes on 2 October. Registration is limited and filling fast, so don't delay in confirming your attendance. The registration fee is exceptionally affordable given the depth of the content and the quality of the speakers. If you're not a member of the Legal Marketing Association, join now and benefit from favorable member rates. While most LMA members spend their days providing marketing and business development services in or to law firms, many new members are in-house counsel, law firm partners, law firm finance and pricing professionals, technology experts, consultants and providers of products and services to the legal profession. LMA is unique in that all stakeholders are full members... no "haves" and "have nots" in this association of like-minded professionals! For insights into the genesis of the conference, directly from the desk of the conference chair and one of the founders of the modern law firm pricing movement, visit Toby Brown's excellent article at the 3 Geeks law blog. For full details on speakers and topics, visit the LMA P3 conference website. Click here to register. And be sure to stay at the fantastic Wit Hotel in Chicago, and join us for a drink at the famed rooftop bar overlooking the Loop.